The Stewart Spider (or more precisely, Stewart Black Spider, because he also created a Red and a Dun Spider) is one of those flies that just seems to work everywhere. It's a fairly small, nondescript, very buggy looking - thing. Fished wet, it imitates nothing in particular but represents everything from a midge to a small black caddis to a black gnat or even a small mayfly nymph. It is a soft hackle fly made with a starling feather, and the soft hackle will pulse enticingly with any twitch of your line. Sounds like an ideal tenkara fly. Stewart's description of it reminds me of Dr. Ishigaki's description of his one and only fly. WC Stewart, who brought the fly to the attention of the world when he praised it glowingly in his 1857 book The Practical Angler, wrote "The Black Spider.--This is made of the small feather of the starling, dressed with brown silk, and is, upon the whole, the most killing imitation we know. We were first shown it by James Baillie, and have never been without one on our line ever since." Baillie was a professional angler, and widely regarded as the best fly fisherman in his day. I recently came across this passage in "The Ne'er-do-Weel: Some Waterside Sketches" by William Sorley Brown: "Did you ever see Baillie fishing?" was my next question. "Many a time," responded the watchman. "I was just a laddie a the time, but I used to see him often on the Gala, though never on the Leader. He had his line tied to the top of his rod just like a whip, and usually fished up and across the water." A professional angler, the best in his day, with his line tied to the top of his rod. Interesting. Stewart thought the spiders were the most effective flies, and wrote "The only objection to spiders is, that the feathers are so soft that the trout's teeth break them off, and after catching a dozen or two of trout, little is left of them but the bare dressing, rendering it necessary for the angler to change them; and if the trout are taking readily, this has to be repeated two or three times a day." Well, I don't know about you, but I wouldn't consider a fly that caught two dozen trout, and only then had to be changed for another that also caught two dozen trout, worthy of objection! They are a bit fiddly to tie, as the starling feather breaks quite easily, but if you try them I think you may find them worth the effort. 1. 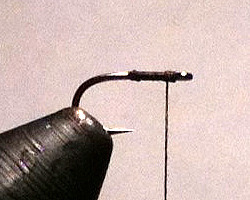 Although Stewart specifically wrote that it was "highly objectionable" for anglers to shorten the shanks of their hooks considerably because it "renders the chances of hooking a trout exceedingly small." I have not found that to be the case, and one of the most accomplished spider fishermen I know regularly uses short shank hooks. My choice of the Daiichi 1640 hook is on his recommendation. 2. Stewart's tying instructions assume you are fishing eyeless hooks on a gut tippet. To stay as true to his instructions as possible, though, (well, other than tying without a vise of course) begin the thread about midshank and wrap towards the eye where you form the head with a few turns of thread. 3. Tie on the starling feather with the shaft towards the hook bend and the feather extending past the eye. Break or cut the feather stem. Although you can make Stewart Spiders with feathers from other birds, the long, lance shaped feather of the starling is particularly well suited. The iridescence of starling feathers may be one of the reasons this fly is so productive. 4. In his tying instructions, Stewart specified that the starling feather should be twisted around the thread. This makes it look a bit like a dubbing brush or a chenille. The thread and feather together are then wrapped around the hook, palmer fashion, down towards the hook bend. He states that "This is a very rough and simple mode of dressing a spider, and does not make it so neat as if the feather were put on by a pair of nippers [hackle pliers], but it is more natural-looking, and much more durable, as the feather is fastened on by the thread the whole way down." Saying "it does not make it so neat" is an understatement. Tying it as Stewart did makes a very scruffy looking fly. That may be another reason they aren't sold commercially. I suspect they are much better at catching fish than fishermen. A number of people have sent me emails saying there is a much easier way to tie Stewart Spiders, which is the way that Dave Hughes explains in his book "Wet Flies." I had his book long before I first wrote this page, and chose instead to more closely follow the traditional method of tying the fly. Hughes' method is easier, but it is just another step further away from the way Stewart tied them. I don't think they look the same, but I'm sure the fish don't care. To tie the fly that way, start the thread at the hook eye and wrap halfway down the shank and back to just behind the eye. Tie in the starling feather by the stem (with the feather extending out over the eye) and then wrap the thread back to the middle of the hook shank. Wrap 3-5 turns of the starling hackle back to the middle of the shank and tie off with three turns of thread. 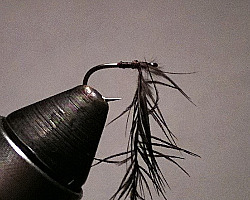 Clip or break off the excess hackle. Work the thread back to the hook eye wiggling the bobbin holder so that the thread goes between the hackle fibers rather than matting them down. Tie a small head and whip finish. 5. When you are finished, you have a very buggy looking fly. Fish it upstream to represent a midge or caddis or gnat. 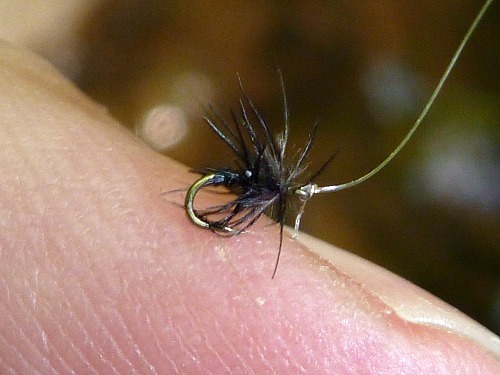 As you pull up the fly to make a new cast, or if you fish it on the swing, the hackles get pushed down against the hook and it takes on a perfect nymph shape as it ascends to the surface. 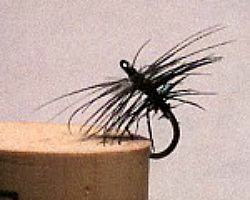 You can also tie Stewart Black Spiders on regular dry or wet fly hooks. The fly shown to the right is tied on a Daiichi 1190 barbless dry fly hook. 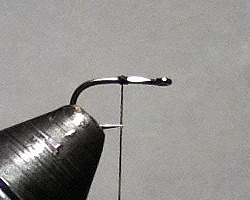 The fly will look a bit strange compared to most flies, as the rear half of the hook will be completely bare. However, it will look much closer to the flies that WC Stewart and James Baillie tied over 150 years ago. I have tied the flies on both hooks and prefer the shorter shank hooks. 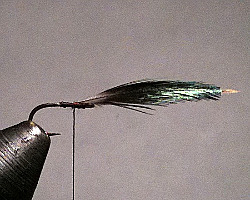 When tied on a standard length hook, the fly rides very much like one of those umbrellas with the hook in the handle - with the hackle on top and the hook bend at the bottom. It looks like the letter "J" with a wider top. I've caught more fish on Stewart Spiders tied on the shorter shank hooks. One of the truly nice things about the Stewart Spider is that you can tie it extremely small. Starlings have very small feathers on the upper neck, and when you buy a starling skin you get those very small feathers. 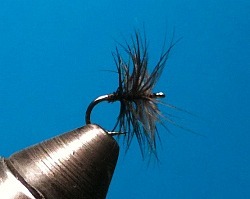 Tie the fly Dave Hughes' way, using thin thread, midge jaws, a good magnifying glass and good light. 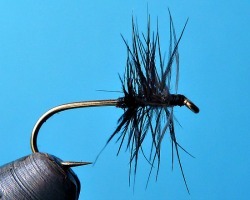 Tthe Stewart Spider in size 26-30 is a great fly if you are fishing with midges or fly fishing for micros. Tied in a more normal size 14, it is just a great fly, period. If you have questions or comments about the Stewart Black Spider please go to the contact us page. I had good fishing results using the Stewart Spider flies you tied. I fished the Au Sable river in Michigan and caught Brook and Brown trout. Good results. I am amazed at how good the Stewart black spider is considering how sparse a fly it is.